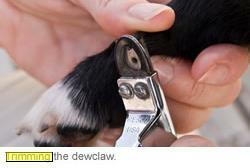 Despite its importance, many people can’t or don’t like to trim their dog’s nails. It’s a task that can make both people and dogs anxious. How do you know exactly where to cut the nail? What if you trim the nail too close and cut the sensitive quick? What if your dog seems worried? Although it can seem daunting, if you keep a few guidelines in mind and maintain a consistent schedule, nail trimming doesn’t have to become a stressful chore. 1) Teach your dog to associate nail trimming with things it loves. 2) Take it slow and easy. Many dogs find nail trimming unpleasant & they just seem to naturally dislike the sensation of people handling or touching their feet. Trimming can also cause discomfort when the clippers squeeze or slightly twist the nail. It can even cause pain and bleeding if you accidentally cut your dog's nails too short and hit the sensitive quick. 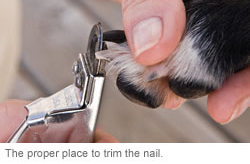 Luckily, you can help your dog to overcome & tolerate and maybe even enjoy, nail trimming. If your dog learns that it leads to wonderful things such as treats, toys or even his favourite walk in the park, your dog will slowly learn to love it. So whenever you trim your dog’s nails, immediately follow up with things he loves & enjoys. For example, clip a nail and then feed your dog a delicious treat. Clip another nail or two and feed another treat. Repeating this procedure and overtime, your dog will probably decide that getting his nails done is fun, not frightening. If your dog isn’t used to getting his nails trimmed, the last thing you want to do is frighten and overwhelm him by rushing the process. Take a little extra time to slowly introduce the nail clippers, as well as the sensations involved in trimming. The first time you use the clippers, don’t plan on giving your dog a full pedicure. Instead, just clip one or two nails, and remember to give your dog treats or play a game with fido right after nail trimming. It will also help if you approach your dog calmly and speak in soft, soothing tones. If you want your pet to relax while you’re trimming his nails, you’ll need to be relaxed, too. There are two types of nail clippers: a guillotine type and a scissors type. The guillotine trimmer has a stationary hole where the nail goes through and a blade that moves up to cut the nail when you squeeze the handles of the trimmer. The scissors type works just like a pair of scissors. You open them and put the tip of your dog’s nail between the blades to trim it. Visit a pet store to look at both styles of trimmers and then choose whichever you feel most comfortable with. 1) Pick up one of your dog’s paws and gently touch his toes and nails for a few seconds. 2) Release his paw and immediately give him something delicious, like a small piece of cheese or chicken. 5) Immediately feed your dog a treat. Repeat steps four and five for several minutes a few times. If you do trim your dog’s nail too short and cut the quick, which contains live blood vessels, the nail will bleed and your dog will likely yelp and pull away. The bleeding can be profuse and long lasting. Stay calm, talk in a soothing voice and immediately feed your dog a bunch of tasty treats. Then apply your clotting powder directly to the exposed bleeding edge to stop the bleeding. Then stop the trimming session and try again in a day or so. Cutting the nail this short would cause bleeding. If you look closely, you can see that the quick, where the nail is pink, is too close to the blade of the clippers. Should You Take Your Dog to the Vet for Trimming? Some people prefer to take their dogs to the veterinary clinic for nail trimming because they don’t have the time, tools or experience to properly trim nails themselves. As long as you remind the veterinary staff not to cut your dog’s nails too short, this option might work well for you and your dog. However, keep in mind that the veterinary environment can cause many dogs significant anxiety. If you take your dog to the vet for nail trimming, watch for signs of distress, such as trembling, panting, drooling, trying to escape or hide, crouching, cowering or whimpering. If you see any of these signs, ask a vet to show you how to trim your dog’s nails so you can do it yourself at home to spare your dog unnecessary anxiety. Instead of trimming their dogs’ nails, some people use a special tool, such as a Dremel, to grind them down. Because this kind of tool sands the nail, much like an emory board you’d use to file your own nails, you can avoid sharp edges and split nails, which are two disadvantages of using clippers. Do not physically punish or yell at your dog if he resists nail trimming. Doing this will only make him feel worse about the activity, and it will probably worsen his behavior. Do not force your dog to submit to nail trimming if he’s obviously frightened.